The Continental's Confetti and Champagna aka #smoothoperatorsocks work up fast. ... practically. I'm so pleased with how these turned out. It was my first afterthought heels and the glitter yarn gives it a celebratory look, right? Susan's pattern is a go,go,go kind of design. I mean, everything is placed and paced to just come together with as little fuss as possible. 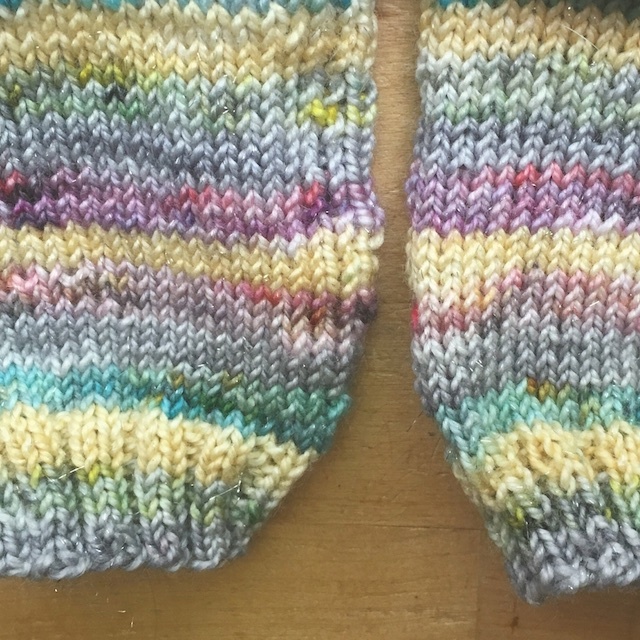 You can stop knitting the sock to do the heel whenever. Then you can close up your heels and toes without a yarn needle for Kitchener if that's more convenient. She walks noobs like me through the whole thing step by step. It's also a handy reference you can pick and choose techniques from. Had I wanted to slow down and read more about what I was doing, I could've. For instance, I didn't want to overwhelm myself, so I just knit the afterthought as directed and skipped some added tricks you can employ to get an even smoother finish. But I did use her Kitchener-less heel and toe to close things up when I was finished. Next time, I'll try some of the the tricks I omitted. The heel looked very triangular and narrow after knitting, but the fit is perfect. 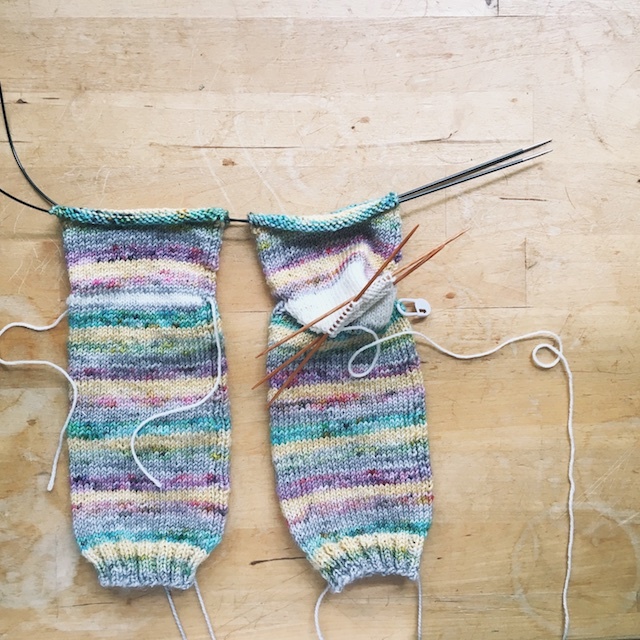 I do have a narrow heel and foot, but I'm hearing lots of knitters say it fit them just right, so it must be a universally perfect afterthought heel. 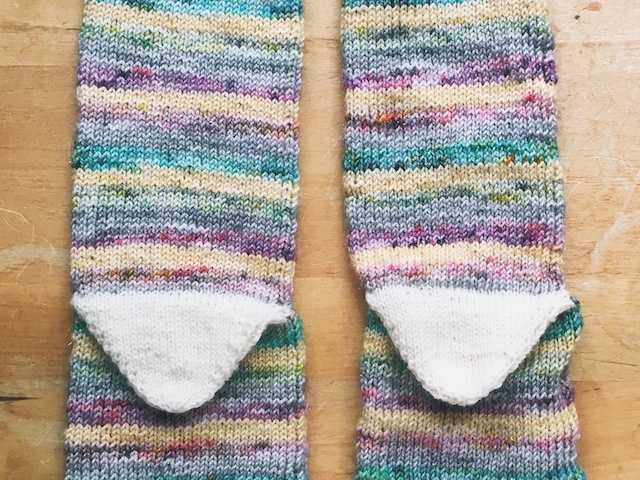 Details: I used size US 0 circulars and Gynx Yarns' Glitz Sock to knit my socks two-at-a-time. I didn't think ahead, when dividing my yarn for each sock, and also create a center pull to use on the heel for each. Honestly, that sounds a little crazy to have all of that hanging from my needles. But if I were to knit them one at a time, I'd definitely try it. Or I could just unwind enough of each skein to have matching heel stripes. Since I didn't consider that, I just used some Valley Yarns Huntington in natural for my heels and toes. I think it looks pretty with this colorway, though I dread to see how covered with dog hair it will be after one wearing, though. Do you realize my beautiful box of socks will soon be sullied with wear? I kind of miss the days when we didn't have to contend with pet hair, just dust. But our lives are fuller now and we love our weirdos too much to go petless. So I have a lint roller dedicated to the living room furniture and we sweep and vacuum a lot. Speaking of the box, I really to get that going, as the hashtag #pileosox would be more fitting. Details: I used size US 0 needles and one skein of Gynx Yarns' Glitz Sock in the Confetti and Champagne 5th anniversary colorway. Guys, I have enough of this for another pair of socks if I want! For the heels and toes, I used some Valley Yarns Huntington in natural. I used a 56 stitch cast on and tried the non-Kitchener toes and heels. So far so good on those. I'll be interested to see how they wear over the long tern, but then this will be my first winter to really wear many hand knit socks. For next time, I'll remember to knit my legs longer. I don't know how practical it is, but I rarely get to wear knitted socks, so when I do, I want there to be some meat to them. I also might try double points to see if the gap created between needles is less than that of magic loop. It's a pain to try to fix that when blocking. I usually finish a post on an FO by saying what I'd like to knit next from the designer. Sometimes I get to it, sometimes I don't. 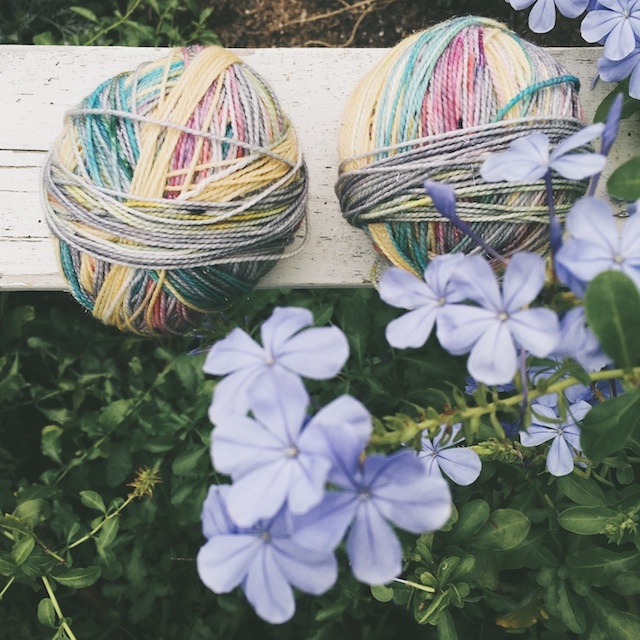 With Susan's page, some of my favorite knits would have to be future knits because they're either accessories or toys for children and I don't have any I'm knitting for right now- her Rav name is Itty Bitty Knits for a reason. When that day arrives, I can so see myself making her Giraffe and the Little Dragon. Both would look great in semi-solids, with speckles. 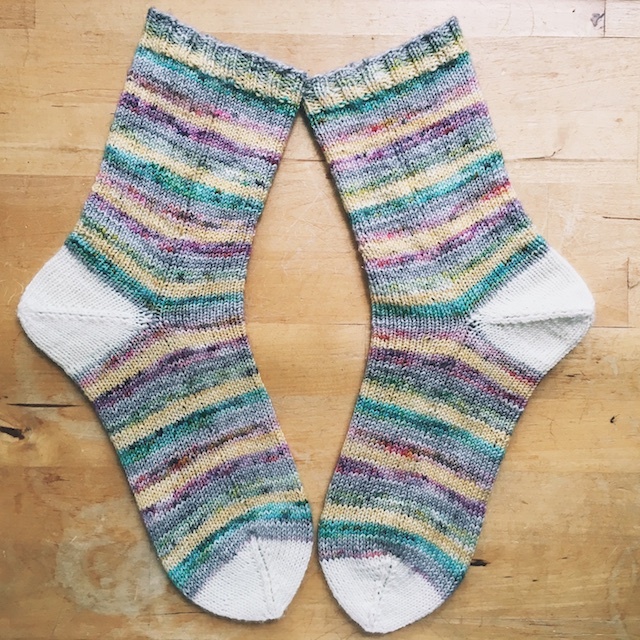 For myself, I already had her How I Make Worsted Weight Socks pattern in my favorites, to make cabin socks for my husband. That one is gonna happen, really it is. 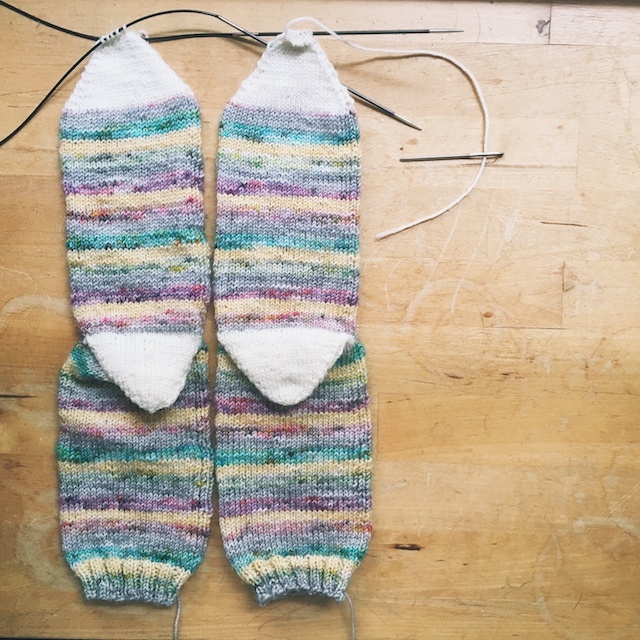 Previous posts on these socks here: becoming a sock knitter?, one of many messy WIPs, and my first afterthoughts.